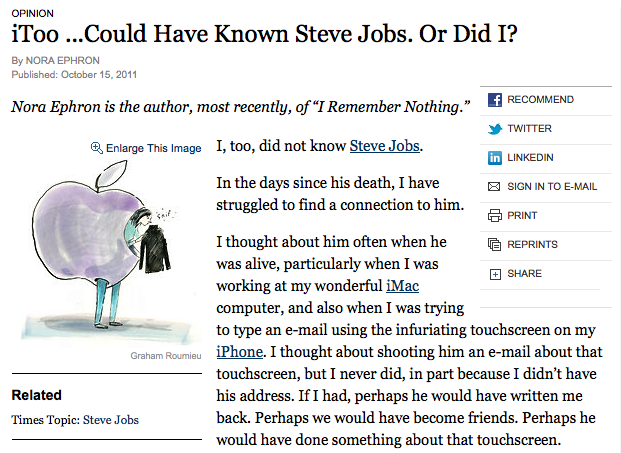 So I guess everyone related to Julie & Julia is publishing their own Steve Jobs-related news in New York publications. This time, our beloved crotchety old lady Nora Ephron wrote an Op-Ed piece about Steve Jobs in the New York Times. It's about her... and how she never met Steve Jobs... or how she has a secret crush on him... or some other stupid, trivial thing. I really don't know. Here's my take: It's pointless and terrible and I don't know why it was published in the Times! I guess 'cuz she's famous or something. Anyways, read it if you want to hate Nora Ephron as much as I do! Julie & Julia Quote of the Day: "We have read your superb French cookbook--studying it, cooking from it, estimating, and so on." It's kind of appalling how little he writes. 321 days. I can't imagine coming up with 321 long, elaborate posts talking about the same movie. Every writer must know grammar very well. And not only for writing his novels, also for that to write good CV or resume, when he or she will search a publisher for new book. I have written various stories and articles for a long time, but still don’t know perfectly grammar. So when I needed to CV, I addressed at https://resumestairway.com/. And my resume was very good and free of mistakes.